Discussion in 'General Knife Discussion' started by Brawny, Aug 12, 2018. 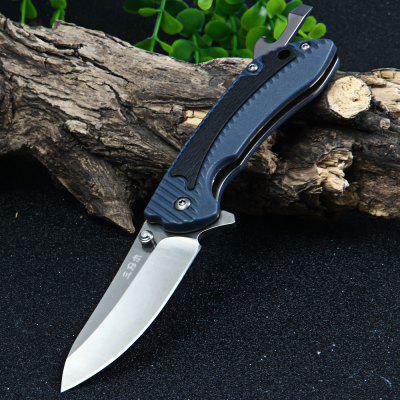 BenchCo Spydermade, Sjp81, Insipid Moniker and 7 others like this. I wish that I had a knife from my pops. I have some from my grandpa. I miss them too. sam eib and Brawny like this. I'm not an overly sentimental guy and possessions don't own me so I thought about selling this knife to help fund another purchase. I'll never use it but I think I'd rather give it to someone I care about. Hopefully a son (my wife is 13 weeks pregnant so not sure what we got). Of course daughters can have knives too! If I were you, I'd save it. You could never put a price on knowing he wrapped his hands around that blade and used it. Being a knife enthusiast, that would mean so much to me. I wear my father's gaudy gold chain and pendant every single day because it was his, and I wouldn't be caught dead in jewelry like that otherwise. My wedding band was my grandfather's from over 65 years ago. BenchCo Spydermade, sam eib, TheEdge01 and 1 other person like this. sam eib, WinchesteRalox and Brawny like this. The only reason I got my dad that knife was my uncle gave him a puma years ago and he lost it somehow. The knife I gave him was not an exact copy but it was close. This is old news for you guys but I don't think I ever actually posted photos. I have told the mini story several times. When I got my first job with an actual paycheck I bought my Dad a Swiss Army Knife for Christmas. I believe it was an Explorer. Anyway a similar SAK. This is my Explorer that I use every day at work (pardon the smudges). Dambed if he didn't take it straight back to the Army Surplus store where we went regularly and traded it in for this poor little sucker. I mean it doesn't even have a tweezers and toothpick. I hope he at least had a beer and shot with the balance. Hahahaha I guess this is what he actually wanted because . . . I mean . . . look at the condition of that blade ! Been carried and sharpened a time or two. I admired him a great deal. His habits and way of doing things. I think I was a complete mystery to him. I rode my bicycle to work (even though I had taken driver's ed and carried a license), stood on my head in yoga poses and had long hair. I still was a TIG welder and metal worker. (some small saving grace in his eyes). When I would go with my friend drag racing (in friend's car) on main street (I was about twelve to fourteen) he would say : Stay out of jail. and when I suggested to Dad that he could ride a bicycle the mile or two to his job he said : The day I ride a bicycle to work is the day I quit working. He was a great person though. I was very lucky to have him for a father ! ! ! ChazzyP, Brawny and SeppukuSamurai like this. I have an old traditional of my Great Grandfather's. It looks like an old Gas Station knife. I also have an older FrankenBarlow that belonged to my Father-in-law. Both are nearly worthless, but priceless sentimentally speaking. My father has only a few cheap junk knives. I have given him a few that he has "lost" somewhere in his bedroom. What I really want to find is the knife, and bong collection that he confiscated from me when I was a teenager, in the late 70s. SeppukuSamurai, WinchesteRalox and Brawny like this. 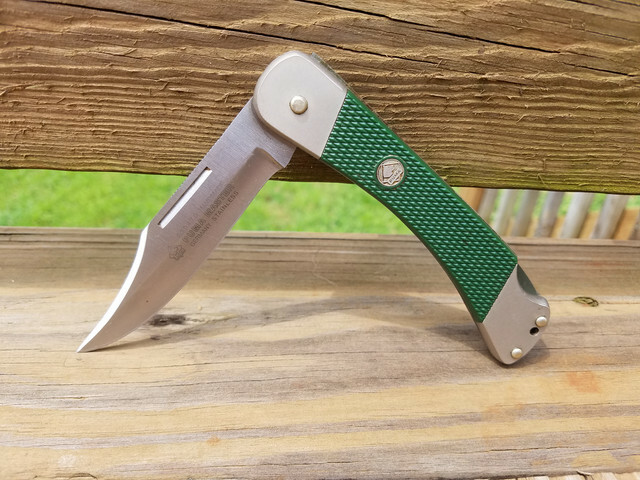 Y'all are getting the prompt backward methinks... Anywho I gave my dad a kershaw knockout that he loves. His first modern folder, still doesn't carry it but now he's talking about buying a SOG fixed blade. I think my nerdy/obsessive love of blades eludes him, thinks I sink too much into something I don't get money out of. I'm trying to convince him to buy a gransfors axe so he will stop complaining about the POS shrade he found in the shed! My dad had a hand injury and arthritis, so I went in search of a knife I thought would be best for him. I felt a Spyderco Native 3 would work best with its ergos, handle size and easy to operate lock. Problem was it was nearly impossible to find. The only one I came across in new condition was rediculously overpriced. 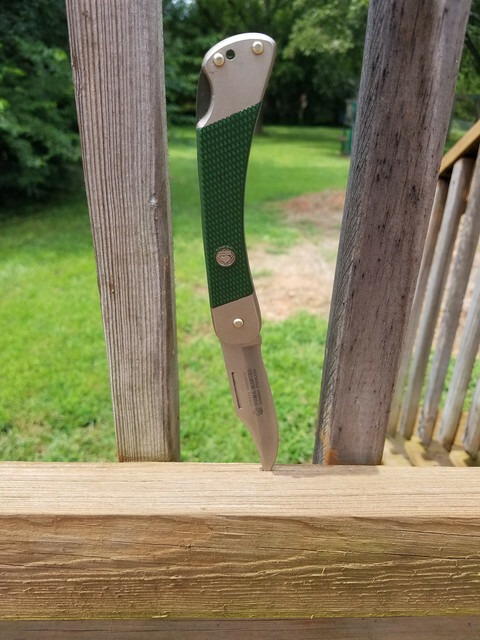 Then a very generous gentleman on the Spyderco forum offered one and refused payment. My dad loved the knife and used it often until his passing. I have of course inherited it but the Native isn’t for me. I will hold on to it and likely pass it on to my nephew one day. My boys had the chance to know Grampa but my nephew wasn’t given the opportunity so I think it might be nice for him to have it. My boys will get plenty of knives from me one day. My father said "thanks, I'll keep it in a desk drawer in my office". Lol. BenchCo Spydermade, lieferung and Brawny like this. I don't have a story to share here, but want to thank you all for sharing yours. It's a moving thread. I'm grateful that my father is still alive, but damn if this thread doesn't get ya thinking. Thanks @Brawny for starting this. SeppukuSamurai and Brawny like this. Well, the last one was the Tops War Bowie, to compliment his Ruger 1911. My dad passed a few years ago and I was in charge of taking care of part of the estate. Over the years I had bought him several nice knives, much nicer than you ever bought himself. He always thought than a knife was something every man should have in his pocket but but never could really bring himself to spend the money on nice ones. So that became his birthday and Christmas presents from me. I bought him a lot of nice traditional style folders. But I realized over a few years that he wasn't carrying any of the knives that I bought him, but continue to carry some of the old worn out knives that he gotten somewhere that had broken blades, cracked and broken scales, and worn out springs. So one night we were at the nursing home when he was at the end of his days, and I told him it was time for him to fess up and tell me why he didn't ever carry any of the knives I bought him. 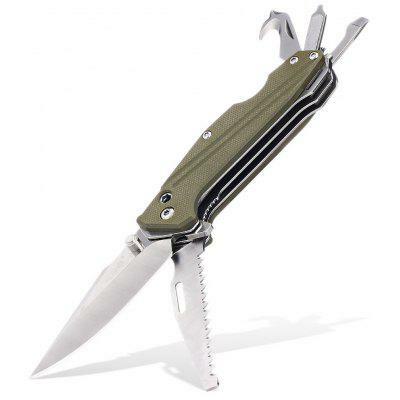 First, he explained that they we're just too expensive and "pretty" to be used on everyday carry snd work projects. So he decided to save them for some appropriate occasion to put them in his pocket, which never came. Second, he told me he had a really hard time getting some of the harder steels sharp and as his arthritis progressed it became impossible. So for about 20 to 25 years all those nice folders set and shoe box carefully oiled, with factory edges on them. It's too heartbreaking for me to think to think about his his mindset concerning those knives, so I don't carry them either. Thinking about gifting them to my nephew when he gets a little older. BenchCo Spydermade, SeppukuSamurai, WinchesteRalox and 1 other person like this. do you know what his regular knife is? I agree with keeping the knife. 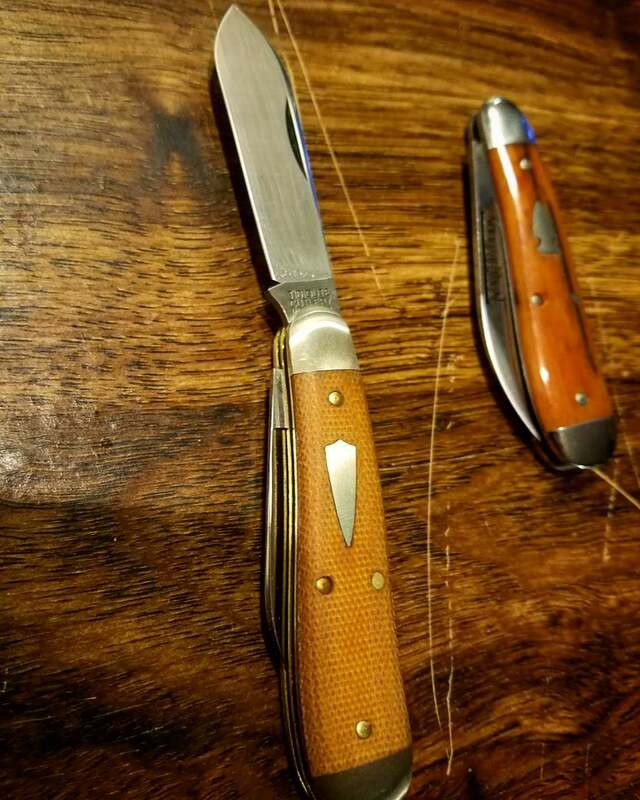 I have an old Boker USA stockman that belonged to my grandpa. My dad gave it to me several years ago, it is in rough shape so it wouldn’t mean much to someone else, but to me it is priceless. My Dad passed in 2010--he'd be 96 if he was still with us. My mom's 94, still with us, and still as mean as ever. It's funny that so many of my parents' generation were handy, owning and using tools, but couldn't bear to spend the money for quality implements. That was certainly the case with both my father and late father-in-law. Perhaps it had something to do with coming from the Great Depression. The stories above of Dads not using "expensive" gifted knives ring very true to me. I have the rolling toolbox I gave Dad over in my shop and it's filled with hardware-store-counter screwdrivers, pliers, cheap socket sets, and wrenches bought one-at-a-time as they were needed. The only quality tools in there are ones I gave him over the years that are still largely brand-new. Anyway, I gave Dad a small wood-handled pocket knife in the style of a Buck 110, though I'm unsure of the maker or model. My sister has it now and I recall it being quite dull when she showed it to me, so he must have actually used it. We'll be out see her and Mom on the way to Vermont in a couple days, so I'll get a pic to post and maybe put an edge on that knife if there's time. That hit pretty close to home for me. Same thing when my father passed. To help generate money for both parent's healthcare when they were in "independent living", at my father's request I started to dispose of some of his property in the shop I built for him. I have been a professional woodworker that builds anything from houses to furniture for about 45 years, most of that while self employed. Two things I don't hesitate to spend money on if I can see the value: 1) tools, and 2) cutting instruments. That includes different work knives, planes, chisels, etc. I have a lot of expensive, hard working, professional grade tools. And I use them enough over a period of time that I actually wear some of them out. So while going through Dad's stuff, it was painful to see how proud he was of his tool collection when it was mostly things that were on the bargain table at the local lumberyard, or were purchased as inexpensively as possible. Some of it was honestly just junk. The only "good stuff" was the gifts from the family that were purchased at my suggestion or something that was so deeply discounted he couldn't say no to buying. Damn little of that, since he thought with better tools people would expect better work from him, too. And since he never thought he would get the use out of a really expensive tool, like his knives, he was happy with mediocre to low end stuff. He wasn't proud of most of his knives, but he was very pleased to pass onto me his very best hunting knives that he picked up in Germany when staged there during the Korean War. Those of course, were never used as they were "too expensive" and he couldn't bear the thought of something happening to them. He was however, proud of his tools. Not one of them was up to my work standards, as I was afraid they would break of be dangerous to use. I couldn't tell him that because I knew how crushed he would be, so I lied to him and told him I couldn't let them go, and I gave him some money for them which really pleased him. I let the estate people have them to sell, and gave him the money for their sale. Just like the situation with his knives, it was pretty painful for me as in retrospect he did an awful lot with just a little. orangejoe35 and Reitwagen like this.